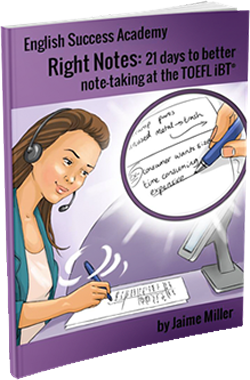 Looking for TOEFL iBT homework to give your students? Searching for material to add to a TOEFL iBT course you’re teaching? Striving for excellence while reducing your planning time? In 2010, I moved away from teaching general ESL and conversation, and I started specializing in TOEFL iBT. I was shocked at how many challenges there were for planning an effective course for students who needed to be ready for TOEFL iBT. And because I was teaching online lessons through Skype, it got even more complex. First off, the sheer volume of exam prep material is intimidating and de-motivating. That alone makes teachers and students wilt like spinach under the summer sun. Plus, for students and teachers overseas, getting physical copies of the books can create huge delays. Even honest people are resorting to piracy because it seems better than jeopardizing their student’s score. After students pay for lessons with you, you may find it difficult to ask them to open their wallet again and make another decision to purchase more expensive books. You could spend your time photocopying and scanning your TOEFL iBT books to share them with students, but that is super tedious and I’m sure you have better things to do. 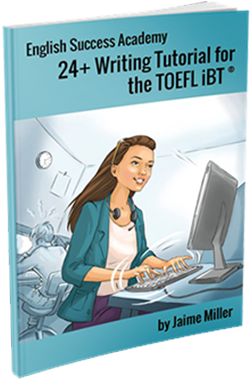 There is no one book for sale that has “the perfect” TOEFL iBT course for all students. To give truly effective lessons, you have to mix and match resources, but which student needs these activities, and which student needs those activities? Almost nothing is written directly to us, as the teachers of TOEFL iBT students. When you have questions, how can you get in touch with the author? Unfortunately, fewer than 15% of ESL teachers prefer to teach exam prep classes (most of us stumble in accidentally, agreeing without knowing what we’re getting ourselves into), so there is a serious “Knowledge Drought” in this area. Also, because most of the authors of TOEFL iBT prep material are anonymized by their publishers, it is hard to know how much you can trust them. Did the authors actually take TOEFL iBT? Are the model responses and essays representative of what actually gets high scores? If this sounds like your struggle, you are not alone. Even good teachers with experience in ESL feel stressed when they have to plan what to actually teach their TOEFL iBT students. After my TOEFL iBT students’ low exam scores proved that I was relying too much on a one-sized-fits-all approach, I started creating my own activities, assignments and strategy videos. Eventually, they grew into full-blown programs that I started selling online. If you’ve looked around the ESA website, you may have seen them. “Thank you so much for developing such an useful material. With the help of Advanced Speaking Guide, I improved my score of speaking from 22 to 26 in just 2 weeks. I really like the way you have given examples how a test-taker talks to score 30/30, and how usual test-taker talks but is limited to 23-24/30. I will definitely recommend this course to my friends.” Nikki A. Did you see Nikki’s testimonial above? It is nice, right? I’m going to be honest with you, though. Most students cannot achieve results on their own with self-study like Nikki did. Test-takers need you as a tutor to guide them, simplify things for them, motivate them, reassure them and make them laugh. Unless you assign them homework, it’s unlikely they’ll finish the course. Unless you’re listening to them and correcting their mistakes, they’ll probably never refine their spoken or written English to the right level that gets the score they need to have the opportunities they want. Without you, they don’t have anyone to point out why their score is low, show them how to do it “the right way” and hold them accountable. They need you. But you need high-quality material to fuel your TOEFL iBT course. And if that material is online, digital and accessible within minutes from anywhere in the world, so much the better! That’s why my team and I have worked hard to create a service that makes you the ultimate freelance tutor for TOEFL iBT lessons. All 4 Programs. In Your Control. Register with us as a teacher. Buy the number of “user licenses” you need. Information about special pricing is below. Note: In addition to the user license(s), you as the teacher also have your own separate, complimentary account to log in with, with your own username and password. Go to your own dashboard and assign access to your student(s). Just type in their name and email address and click save. 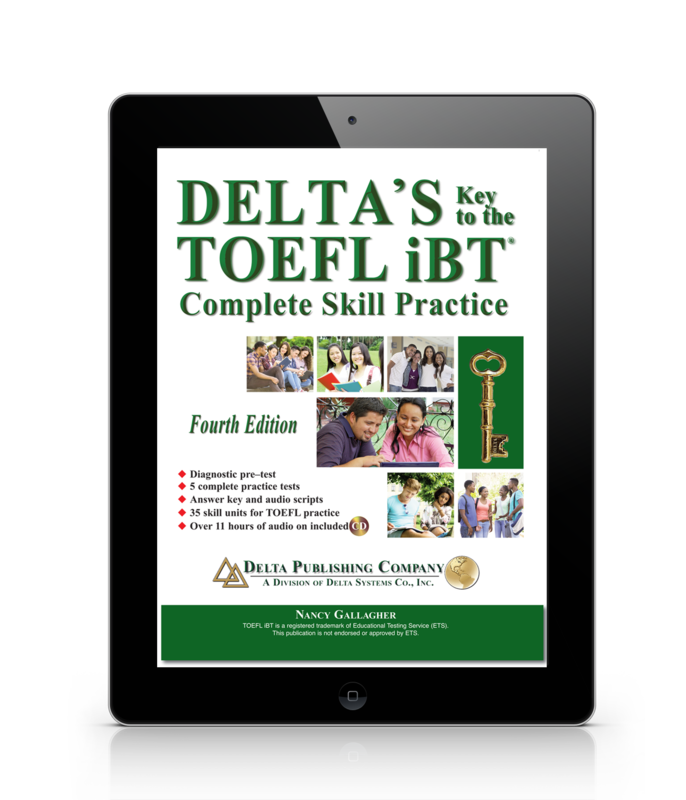 That student will get all the information he or she needs to log in and study with Delta Publishing’s Delta’s Key to the TOEFL iBT and any or all of ESA’s three programs: Right Notes, Advanced Speaking Guide and 24+ Writing Tutorial. Revoke that student’s access or deactivate their account after they finish studying with you. It doesn’t matter if the student studies with you for a few weeks, months or a year. That user license has lifetime access. Reassign that same user license to the next TOEFL iBT student who studies with you. You can reassign the same user license an infinite number of times. It is “lifetime access.” It never expires. Unless there’s a Zombie Apocalypse. achieve their target scores and new people take their place. There is no subscription or renewal cost. 20+ user licenses Contact us for a quote. Q: Is there technical support? A: Yes! If you or your student has a problem with accessing a program, the support team for English Success Academy will help. This means that you don’t have to worry about answering your students’ IT questions. A: Easy. How many TOEFL iBT students are studying simultaneously with you? That number is the number of user licenses you should get. Q: What happens if I tell the user license password to multiple students? A: Each device that logs into our study website has an IP address. We limit the IP addresses that can log in for each username, so at least one student will get locked out. Q: Do I need to buy a license for myself? A: No. You get free access and your own username to log in and review the course. Q: If I get just one user license now, and later I want another one, how much do I pay? A: If you buy one license now, it is $227 USD. You will pay $197 for the second license. Q: I know I will teach two TOEFL iBT students simultaneously. Should I buy 2 licenses now or get 1 now, and 1 later? A: It is your choice. The advantage of getting both now is that you get the discounted rate for each of them, so you ultimately save $30 USD. Q: What level does my student need to be to use these programs? A: We’ve used these programs with hundreds of students — with levels from intermediate through advanced. Lower level students often learn significantly more vocabulary than higher level students. Regardless of their level, everyone gets something out of it. Remember, we give refunds on fewer than 1% of these programs for a reason! Q: How much material is in the programs? A: A lot. Remember, almost no student is going to do everything here. Right Notes is designed to be followed for 21 days, 30-45 minutes per day. However, the real progress happens when you review and edit the speaking and writing activities that students create. These kinds of in-class extension activities for grammar and vocabulary can easily fill 30 to 45 minutes, twice per week. 24+ Writing Tutorial has nearly 30 separate activities. For a student who knows nothing about the TOEFL iBT writing section, we recommend allocating 2-3 weeks to absorb the content of the program, and another 3-4 weeks of regular intensive writing practice. 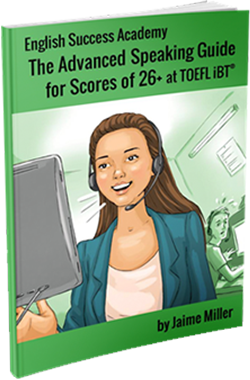 Advanced Speaking Guide for Scores of 26+ at TOEFL iBT is the ultimate program. Students who already have advanced English can study with it for 4 weeks to learn the strategies. Students who need remedial grammar or vocabulary building (or help with intonation and pronunciation) should add another 6 to 16 weeks. Think of it as a giant resource bank with hundreds of choices—from perfect-scoring model responses to TOEFL-relevant pronunciation and intonation activities. Q: What if I decide this isn’t right for me? A: You and your student have 30 days to try our programs and request a refund.